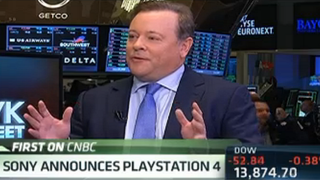 On CNBC last night, Sony CEO Jack Tretton implied that games for the company's newly-announced PlayStation 4 won't retail for more than $60. "We're gonna welcome free-to-play models, games from 99 cents up to those 60 dollar games," he said. Later, he added: "We'll justify that $60 price point." That might come as welcome news to gamers who expected another $10 price jump like the one we saw last generation, when $50 PS2 games led way to $60 PS3 games. But is a $60 price point really sustainable? When in doubt, ask the federal government. Check this out: according to the U.S. department of labor's inflation calculator, $60 in 2006 would have the spending power of $68.54 in 2013. And if the PS4 is around for the next 5 or 6 years, that number could just keep growing and growing. A $60 price point in 2013 really means that games are now cheaper. So yes, $60 PlayStation 4 games are actually cheaper than $60 PlayStation 3 games. Which means we shouldn't be too excited just yet. Big video game publishers will inevitably find other ways to make up the bottom line, which may mean more downloadable content packs, more subscription fees, and more sneaky ways to get you to pay more for video games. Not to be bleak. But hey, Chrono Trigger, which ran for $80 back in 1995 (according to an old buyer's guide I just found on Nexis), might cost $120.88 in 2013. At least we're not there yet.